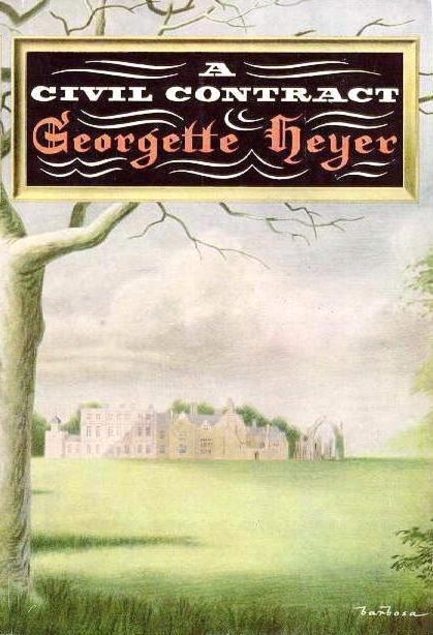 A Civil Contract by Georgette Heyer was first published in 1961 and it’s quite different from her other books as there’s really not much in the way of humour in it, no witty repartee between couples. There’s a lot of history in it, but it’s never dry. 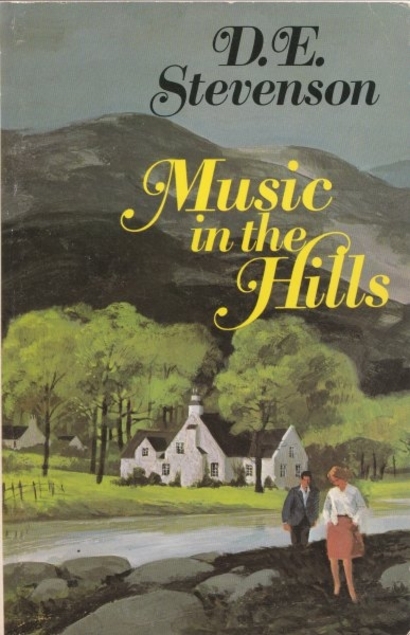 Apparently Georgette Heyer hated this book and she had a very tough time writing it. The problem was that her mother was seriously ill and in fact dying while she was writing it, so it would have been strange if she had been able to write in her normal fashion. I’d like to be able to tell her how much I enjoyed it though, in fact I think it’s my favourite so far, despite the fact that I so enjoy her more usual witty dialogue. A Civil Contract features Adam, Lord Lynton, a young man who has only just come into his title after the death of his father. His father had been a spendthrift, womaniser and a gambler and has left nothing but debts. The only way out of the mess his father has left him with is to sell the family estate. Adam’s mother is dead against that and he isn’t keen on it himself. Adam’s lawyer knows a way out of the problem – he suggests to Adam that he can arrange a marriage between him and the daughter of a very wealthy businessman whose ambition is for his only child to marry into the aristocracy. So – very different from Heyer’s more usual romantic relationships and the upshot is a more realistic progress of the development of a marriage. Sometimes music accompanies me in my mind as I read a book and with this one it was Mama Cass’s It’s Getting Better. Completely inappropriate for a Gerorgian setting I know but the sentiment is the same. It occurs to me that you have to be of a certain age to remember Mama Cass though! That says it all really but if you want to know a bit more – Vittoria Cottage has been in the Dering family for generations, but the most recent owner has died and left his wife Caroline and three children as the inhabitants. The husband was a moaning grump, always feeling sorry for himself so he’s no loss and it’s a comfortable life for Caroline, especially as she has help with the housework from an adoring villager with the wonderful name of Comfort Podbury. Caroline’s two daughters and son are young adults, the son being in Malaya in the army fighting bandits/terrorists. Caroline is completely honest with herself, she adores her son whereas her daughters are just daughters and Leda in particular she dislikes a lot, she’s too much like her miserable father. When Leda gets engaged to a young neighbour Caroline knows it isn’t for the best but there’s nothing she can do about it. Meanwhile there’s a new man in town and Caroline likes him – a lot, although he’s a bit of a mystery. Things get more complicated when Caroline’s actress sister turns up. 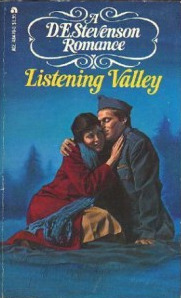 With a cast of villagers providing some more interest and tension this turned out to be an enjoyable comfort read. 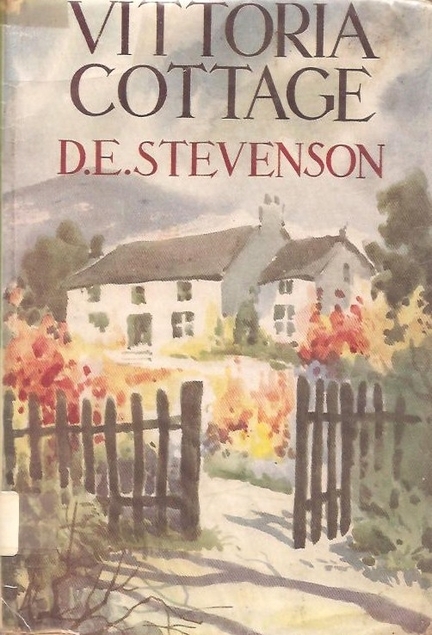 This seems to be the first of a few Stevenson books featuring the Dering family so I’ll have to track down the others, luckily Fife libraries seem to have quite a lot of her books in their Reserve Stock. No doubt they held on to those ones as she is a Scottish author. The Tall Stranger by D.E. 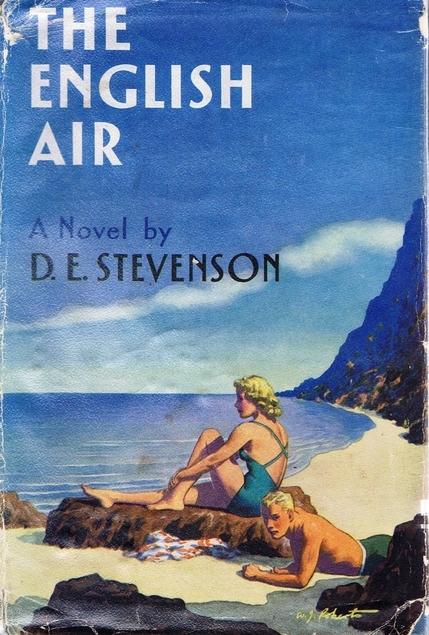 Stevenson was first published in 1957 and I was lucky enough to find this one in a second-hand bookshop in Kirkwall, Orkney. I see D.E. Stevenson as being a sort of updated O.Douglas in her writing style and content, although not quite as ‘churchy’. This one begins in London where the people are having to cope with a horrendous fog that has lingered for almost a week, but thankfully about half-way through the book the action moves to the clear air of the Scottish borders. Barbie and Nell are great friends and flatmates. In some ways they’re quite different with Nell being happy running around with lots of different boyfriends and cheerfully accepting lots of gifts from them. She works as secretary for a doctor. Barbie is much more choosy about men friends, and at the beginning of the book she’s in hospital, seemingly having lost the will to live. When she improves enough to be able to travel she goes to Scotland to stay with her Aunt Amalia/Lady Steyne who lives in a lovely old house called Underwoods. There she meets up with her step-cousin, someone she hasn’t seen for years, and at first Barbie is charmed by him. This was a good read, D.E. Stevenson’s books have the reputation of being light comfort reads, but they also have a serious side. Barbie has a career that she loves and is very good at, she’s an interior decorator and the thought of giving that up to please a husband isn’t a pleasant one for her. Quite a modern concept for 1957 I think. Also there’s a moment in this book when Barbie realises that she’s not at all happy with her discovery of an unexpected trait in her fiance’s character. It’s a shock and a game changer for her, she’s wise enough to have a complete re-think about her future. I’m sure that this is something that must have happened to a lot of people, and they have looked back and thought – that was the time when I should have taken steps to change things. Not just a comfort read. Jutland Cottage by Angela Thirkell was first published in 1953 and early on in the book the inhabitants of Barsetshire are quite despondent as the death of King George VI is announced, like everyone else it comes as a shock to them as they had thought he was getting better after an earlier health scare. They’ve just realised that they now have three queens: Queen Mary – King George’s mother, Queen Elizabeth the King’s widow and the new young Queen Elizabeth II – the one who should really have been called Elizabeth I of Britain if you ask me! But most of the book is concerned with the Phelps family who live at Jutland Cottage. The head of the family is Admiral Phelps, retired from the Royal Navy but still fighting the battle of Jutland on a daily basis, with anyone who is willing to listen to his reminiscences. He’s not in the best of health and nor is his wife, in fact between them they are running their poor only child Margot ragged as she is running their house and smallholding single handed as well as looking after them. 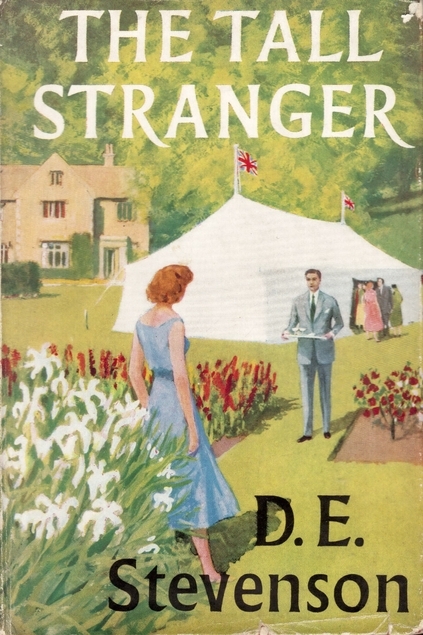 Margot’s plight is taken up as a charitable cause by the neighbourhood and as she is taken in hand and spruced up by the very beautiful but dim and madly annoying Rose Fairweather nee Birckett, who it turns out has become very kind and thoughtful despite the fact that she is finding everything too shattering. The Wiple Terrace inhabitants feature quite a lot in this book, single handedly taking on the national debt via booze tax by the sound of it as they sink enough alcohol between them to float a ship off. This is the sort of book which I can’t help reading bits out of every now and again, and Jack is usually quite appreciative of the excerpts. Thirkell must have been a great observer of old married couples and their relationships, she’s so authentically amusing. 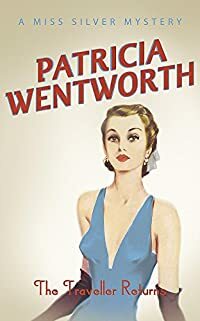 After reading quite a gruesome crime book it was a real treat to dive into the silliness and rambling writing of Thirkell and re-visit the towns and villages of her Barsetshire. This isn’t her best book, my favourites are the wartime books but I still loved it and for anyone interested in the social history of the time it’s a must. I only have a few of the Barsetshire books to track down now and I intend to re-read them all in order eventually as I’ve just been reading them as I’ve got them. If like me you are ticking them off in a notebook (it comes everywhere with me just in case I come across a booksale on my jaunts) as you go then you might be interested in this list of Thirkell’s books. Frederica Merriville is the eldest daughter in her family and has been thrust into a position of authority due to their mother’s early death. Frederica is only in her 20s but has absolutely no ambitions for herself, beyond looking after her younger siblings. She’s determined to get her beautiful young sister Charis married off successfully and with this in mind she takes her off to London to launch her into high society. The Marquis of Alverstoke is their very distant cousin, he’s in his 30s and very much the man about town, wealthy and fashionable and has had more than a few affairs but has managed to dodge marriage. To Alverstoke’s astonishment he finds himself being charmed by his young relatives, particularly the youngest Merriville boy, Felix who is obsessed with steam and the technological advances of the day. The story is heavily littered with Georgian slang and has plenty of humour. It reminded me of an English upper class version of O.Douglas’ books, which almost always feature a managing but young mother figure of motherless children, and particularly a cheery and lovable lad aged about ten.